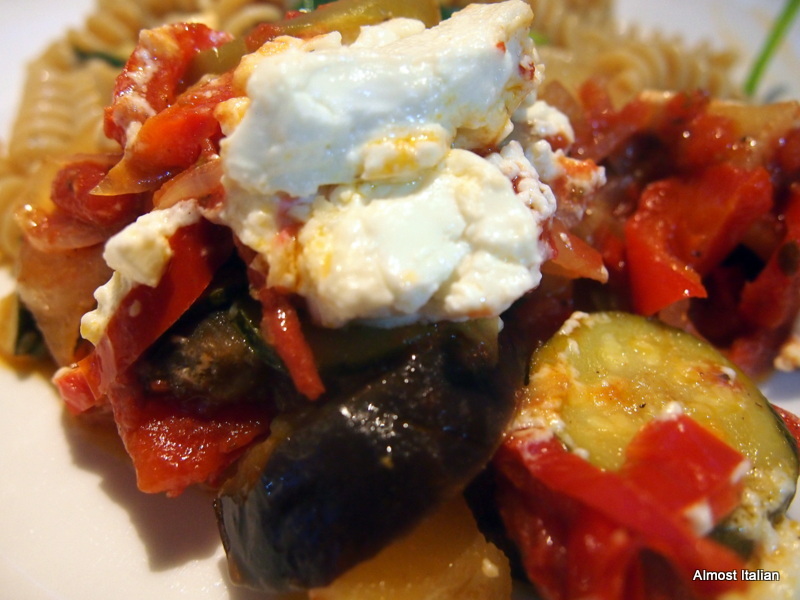 In Autumn, hearty Greek dishes form a harmonious bridge spanning summer and winter. Many vegetables are at their peak, particularly eggplant and peppers (capsicums) and summer vegetables, such as zucchini, still linger. I have noticed my Greek neighbour Anna, who loves Olive oil, kasseri and fetta, and fish straight from the Vic Market, cooks differently each Autumn, in keeping with the dietary restrictions of her church during Lent. For the Greek Orthodox Lenten fasting means abstaining from foods that contain animals with red blood (meats, poultry, game) and products from animals with red blood (milk, cheese, eggs) and fish and seafood with backbones. Olive oil and wine are also restricted. The number of meals on each day is also limited. Vegetable margarine, shortening, and oils are allowed if they do not contain any dairy products and are not derived from olives. This is a bit tough! No Olive oil or cheese? Apparently oil may be had on Saturdays and Sundays only. 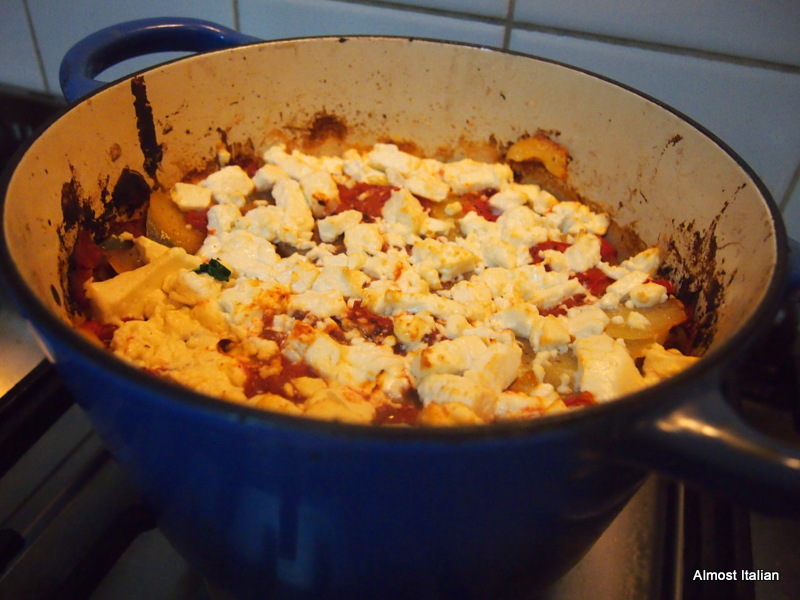 This dish, Briami Me Fetta, Μπριάμ με φέτα, or vegetable casserole with fetta cheese, is not in keeping with Greek Lent dishes. 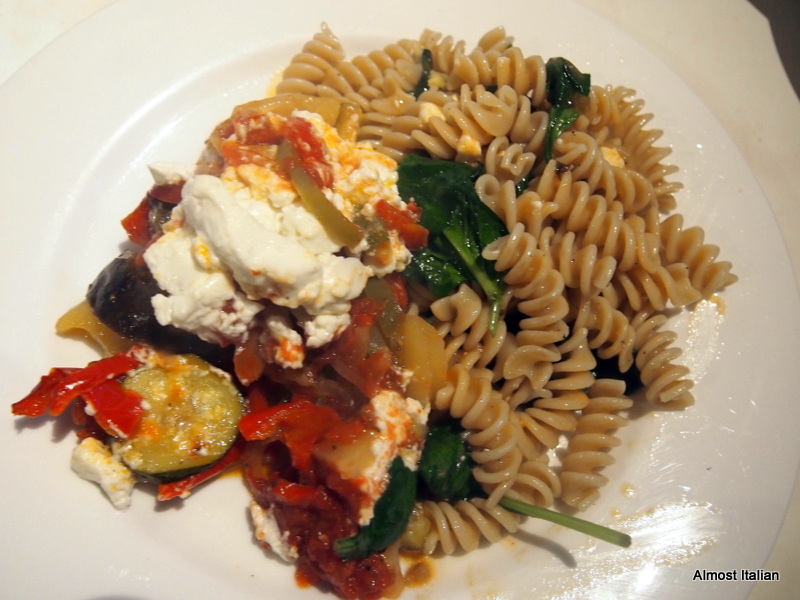 It includes plenty of EV Olive oil and includes a lovely topping of fetta cheese. It is similar to Ratatouille but the layering method makes for a lasagne style vegetable dish, with the potatoes and fetta adding more interest. 250 gr fetta cheese, thinly sliced. Cut eggplants into thin slices. If they are fresh and young, there is no need to salt and disgorge them. If they are older, sprinkle with salt and let stand in a colander for 1/2 hour or so, then wash and squeeze dry. 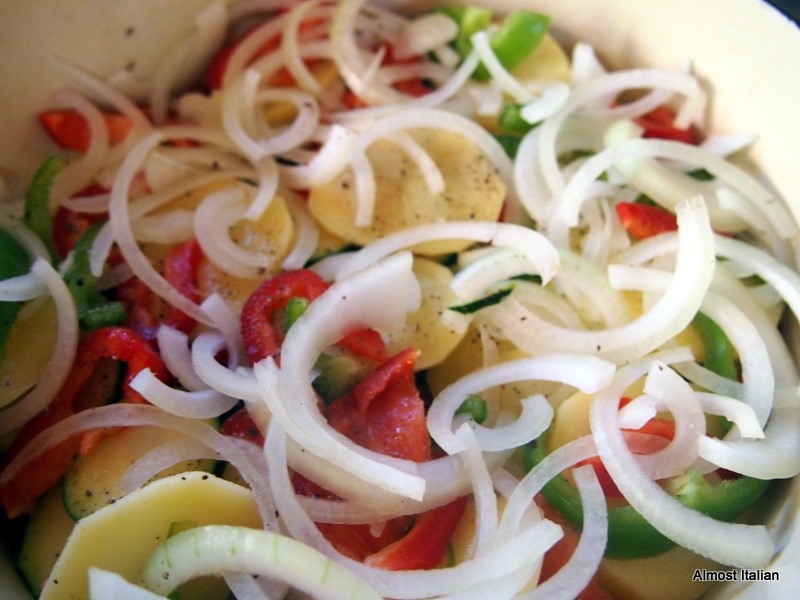 Slice the zucchini, onions, peel and slice the potatoes, seed and slice the peppers. Combine the garlic with the canned tomatoes, tomato paste and sugar in a bowl. Lightly oil a large oven dish or a heavy metal casserole, Arrange the eggplant, zucchini, potatoes, peppers in layers, seasoning as you go. Then cover with a layer of onion rings, tomato mixture and chopped herbs. Repeat these layers until all vegetables are used, finishing with tomato and herbs. 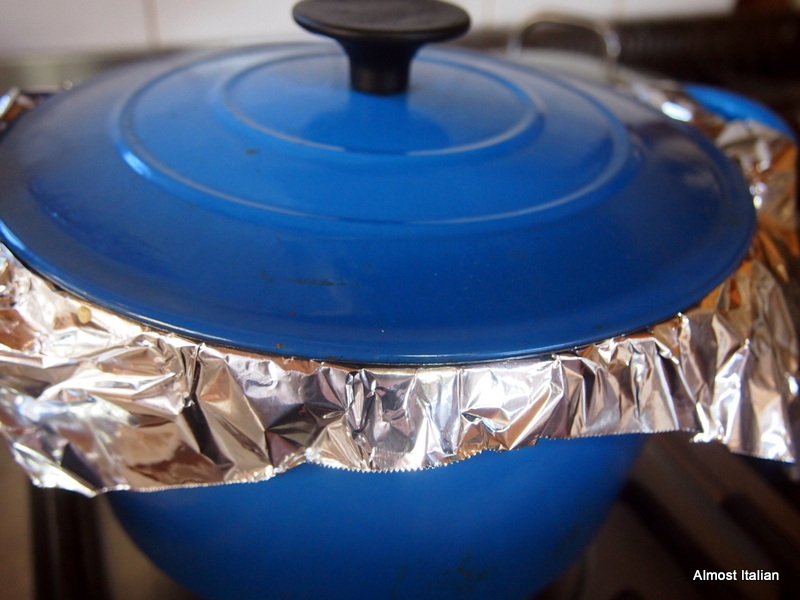 Pour oil of the top and down the sides of the dish, cover with foil ( and a lid if using a heavy casserole) and bake until vegetables are tender or about 1 1/2 hours. Remove cover and place fetta on top. Bake uncovered for another 15 minutes. Serve with one of the following: crusty bread, small pasta shapes, rice or bulgar pilaf.